Mike & Gabby: A Perfect Score! 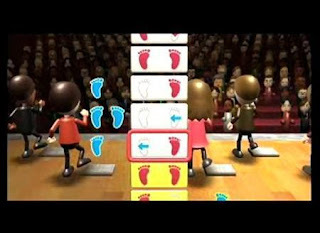 Today I finally managed to get a perfect score on Advanced Step for the Wii Fit! 672 points! I've been trying at this for a while now. In fact, this was my 59th attempt. Each time lasts 5 minutes and requires 336 steps - forward, backward, side-to-side, sideways and with a kick. In order to get a perfect score, you not only have to take the correct step, but you must also have perfect timing. I'm a little rhythmly challenged so it took me a while to get the pace right. Truly a momentous feat! Congrats!